The first great thing about the house was where it sat, at the end of a dead-end dirt road -- the kind of road on which a strip of green grows up the middle, in between the tire tracks. You couldn’t see the house from the turnoff, but when you got to the place where the house came into view -– sitting on a rise, with a giant maple tree in front, and a stand of old lilacs, it turned out to be just what you’d hope to find there : a simple center-chimney cape with a screen porch out back, overlooking a stand of old apple trees. The only sound a person might hear, from the front yard, was the sound of water running over the rocks at the waterfall and the swimming hole not far from there, with a stone arch bridge beside it. Later, there would be the voices of children. I first laid eyes on the place in 1973, when I was 19 years old. I was in no way recovered from a heartbreak so crushing I believed I’d never know happiness again, but at least I could plant some tomatoes, and this was definitely the place for that. The house sat on 50 acres, largely wooded, but with sunny open fields all around, though there were secret mossy places too. In one of those, a patch of ladyslippers grew. It was an odd thing, no question, for a 19-year-old to buy an old house at the end of a dead-end road as I did, back then — a house five miles outside of a very small New Hampshire town, 30 miles from the nearest movie theater. With no boyfriend in the picture. No picture in the picture, actually. I had left college for love, the year before, and when the man for whom I’d left told me to go away, it seemed as if there was no place on earth for me, until I found that house. The one thing I had at the time, though it offered slim comfort, was $17,000 cash, the proceeds from a book I’d just published. That spring, I was being touted as “The Voice of Her Generation” — pictured on the book jacket looking out from under my bangs, wearing my blue jeans. I’d written in the sharp, confident tone of a girl who knows just what she’s doing , when the truth was, I didn’t have a clue what to do with myself. Amazingly, considering I had no job and no additional assets, the bank gave me a mortgage. When I moved in that May, I believed that I’d live in that house forever. I rehung the shutters and got rid of the bats. I insulated the walls and planted six flats of pansies. I bought an oil burner. Also patchwork quilts and a wide plank table around which I imagined a family gathered over a meal of home-grown vegetables, though I ate alone in those days -- yogurt or popcorn, mostly. I lived on my own in that house for two and a half years, but with another winter coming on, I drained the pipes and took myself to New York City and got a job. Eighteen months later, when I met the man I would marry, I quit my job. I gave up my apartment in Gramercy Park, he gave up his art studio in SoHo, and the two of us moved back to New Hampshire. We celebrated our wedding that summer, out by the apple trees, danced in the kitchen, made love by the fireplace. I posed for naked pictures he’d draw of me, and less than a year later — on the bed, under the patchwork quilt, our daughter shot howling into the world. What can you say about 12 years of a marriage, a quarter-century after its dissolution? Two more babies were born on that bed. There was a blizzard once with snow so heavy we couldn’t see out the windows, and a hurricane, and once the Thanksgiving turkey caught on fire, so we ate in the shed. There were a few thousand meals, and one homemade bûche de noël, stuffed down the kitchen sink on Christmas day, with a baby crying and a toddler needing a change and the football game on. Tears from one of us, stony silence from the other. There was a thing I used to do, every time I returned home, and reached that place on the dead-end road where our house came into view. I’d say, “I’m home.” Say this out loud. We got a puppy. We built my husband a studio, and a little wood-heated writing cabin for me. We dug a pond, and all that summer, while the backhoe worked and the water trickled up from below the ground, our sons played naked in the mud. Later, we swam, and the next spring I scattered lupine seeds all around the pond’s perimeter, gathered on a trip to Maine. We cut firewood and dug a garden, and from the tomatoes I grew there, I canned enough tomato sauce for a year’s worth of once-a-week spaghetti dinners. Winter nights, if there wasn’t snow yet, and the moon was out, we skated on the pond — hearing what sounded like deep, hollow cracking all the way to the center of the earth, under our skates, but really it was just the ice expanding as we flew across the surface. A day seldom passed in summer that we didn’t swim. Sometimes in the lake outside of town, or the swimming hole by the brook. When the children were old enough, they’d jump off the rocks at the waterfall, though it scared me, watching this. They had no fear, but I did. We argued a lot. More and more over the years, mostly about topics I no longer remember. Sometimes, in the night, when everyone was sleeping — husband, children, dog — I got up and paced through the rooms of that house. I didn’t have to turn on the light. I knew every knot in the floorboards. Once, when driving, I had told him, “If you don’t say something, I’m going to jump out of this car.” Another time I’d held a pair of scissors open over one of my braids. “I’m going to cut my hair off,” I said. The problem being, I was the one who would have cared about that. There was someone else, but that was never the real problem. I moved out in the fall of 1989, when our children were 5, 7 and 11. I had lived alone once already, in that house. Alone again — but with children this time — felt too hard. So it was my husband who stayed there, my husband — ex-husband now -- who buried our old dog. And later, it would be his name on the title of that property. On maps of the town now, the dead-end road bears his name. The woman who shares the house now with my children’s father has three children of her own, and they have one together. A beautiful boy, who sometimes reminds me of our sons, except he also looks like his mother. Our two grown sons live on the West Coast now, but when they speak of “home,” it’s the house at the end of the dead-end road they’re talking about, not where I live. Our daughter has stayed at our old place. She lives in my old wood-heated writing cabin with her boyfriend. In a few months, she will be as old as I was, when I moved away. Many people live at the end of that dirt road now. There are big meals full of vegetables from the garden, spread out on the long pine table. I’m just not the one cooking them. For a long time — more than 20 years — I felt angry about this, and I (once the destroyer of that bûche de noël) concealed my anger poorly. When I would drive down the dead-end road –- as I do still, when I go to see our daughter — I registered a hard, tight knot in my stomach, and a bitter taste filled my mouth. 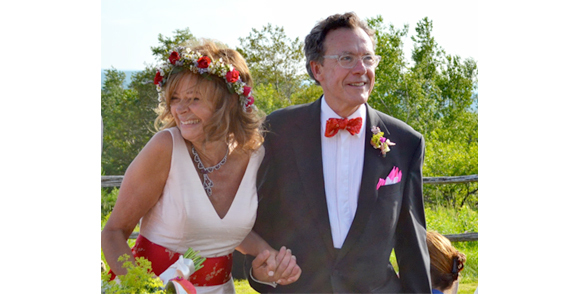 This summer — 36 years from the first time, and four months before my 60th birthday — I got married again. It was a perfect summer weekend, same as it had been back when I was 23, with a baby on the way already, back when I possessed the unshakable belief I’d live at the end of the dead-end road forever. We believed many things would happen back then. We are both of us — this man I married and I — no longer even close to young, and veterans of enough wars we have no taste for those old battles. Our days feel way too precious now for that. Friends came from all over to our wedding. We danced for hours. My three grown children — and his — gave their blessing, and danced too. After, my daughter returned to the little cabin on her father’s land. She wants to build her own house there, she tells me. Possibly by the pond, where the lupine has gone crazy, seeding and reseeding itself. The lilac trees were mostly leveled in an ice storm a few seasons back. But there's a sauna now, and a greenhouse. A horse, even, and a yoga studio where she and her father both hold classes. It is no longer inconceivable that I might attend one, someday. Out behind the house, the tomato plants appear to be thriving, and down the road, after a week of rain, the water crashes over the rocks at the waterfall, swirling and eddying so fiercely a person would have to be crazy to jump in, though it will calm down by late summer. Water under the bridge is what they call it, I think.